Sometime in 1974, when I was 11 or 12 years old, my dad took me to a new restaurant in Woolwich, south-east London. He had read about it as it was the only British outlet of a chain that was huge in the United States and, as we were passing through Woolwich on one of our regular Red Bus Rover trips around London that we took on Saturdays when Millwall were not playing in the capital, he decided we should give it a try. I have no exact memory of what we ate that day but I do remember my dad’s words as we left the restaurant: “Well, that was terrible; it’ll never catch on.” Typically, he was half right. It was terrible, but it did catch on. We had, of course, just visited the first McDonald’s in this country. Where my dad was most at home eating when we went on a Red Bus Rover – a very early version of the Oyster card but for buses only – was at Jolyon on the corner of the Strand and Duncannon Street, opposite Charing Cross station. It was one of a chain of cafeterias that were successors to the Lyons teashops, or Corner Houses as three of the central London branches were known, that had dominated high streets for the previous 70 years. Struggling to maintain the demand for large-scale affordable dining that had grown out of the war-time canteen culture, the 1970s saw a make-over that relied on formica, brown geometric patterns and a funky renaming to reflect the founding father, Joseph Lyons. The re-launch failed and by the end of the seventies the Lyons name was most well known as a brand of ice cream. The restaurants never regained their place at the forefront of British life that they had occupied before, during and after the Second World War. Just how integral Lyons teashops were to the post-war cultural landscape can currently be seen in an exhibition, The Lyons Teashops Lithographs: Art in a Time of Austerity 1946-1955, at the Towner gallery in Eastbourne. Facing a drab period where rationing still held sway and raw materials were prioritised elsewhere, J. Lyons & Co found an imaginative way of sprucing up their restaurants and illuminating the lives of their customers: they commissioned a series of large lithographs, from artists of the day, to cover the walls of the teashops. Over three series, in 1946, 1951 and 1955, 40 separate prints were produced by leading artists such as L.S. Lowry, John Nash, John Piper and David Gentleman. Most of the contributors had worked as official war artists, documenting daily life on the home front in a time of conflict, so the shift to peace time adversity was a natural one. All 40 prints are on show at the Towner, along with some original sketches and paintings that informed the lithographic process carried out by commercial printers Chromoworks of Willesden. Depicting life in post-war Britain, they present a fascinating example of the power of public art. The most successful at the exhibition are those, such as People by Barnett Freedman and The Railway Station by Edward Arrdizzone, that provide a glimpse of the grind of the time – the crowds and careworn faces of that austere post-war world. East Sussex features with Edwin La Dell’s view of Hastings from East Hill and Clifford Frith’s brooding The River Rother at Rye. 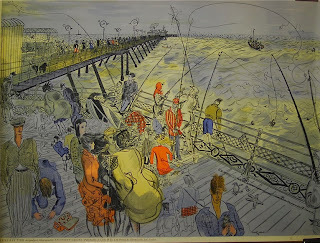 But for me, nestling next to each other in a corner of the gallery, the contrast between Carel Weight’s melancholic and autumnal Albert Bridge and the spirited and energetic Herne Bay Pier by Anthony Gross, shows the true resilience of ordinary people in an age of austerity. Perhaps that resilience explains why the streets are not filled with people throwing bricks in protest at our current age of austerity - but it does not explain where the response of art is now. I cannot imagine the fast food heirs to Lyons embarking on a similar project - corporations regularly sponsor art exhibitions, but that is merely advertising. What J. Lyons & Co did was to directly commission, oversee and exhibit these artworks to enrich the lives of the ordinary people who drank their tea. The Lyons Teashops Lithographs: Art in a Time of Austerity 1946-1955 is at the Towner gallery, Eastbourne until 22nd October 2013. £5.50/£4 concessions.